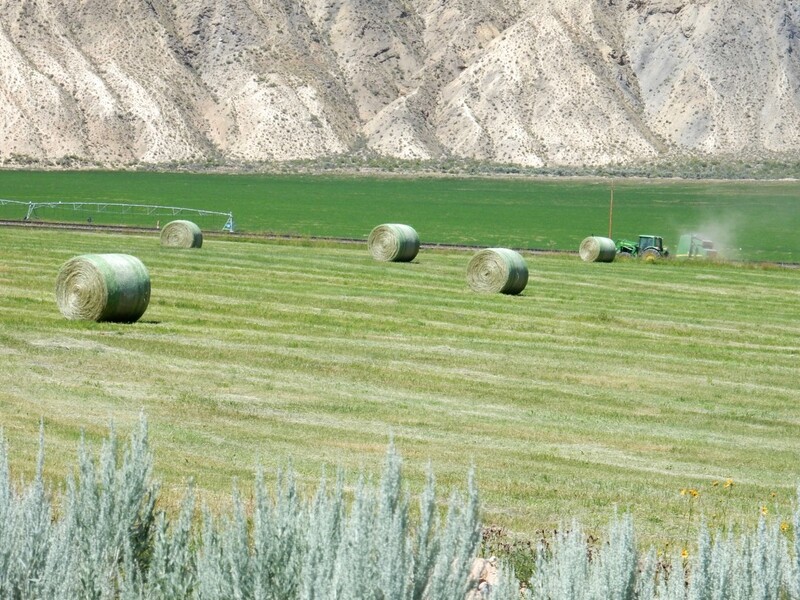 A hay field along on the Colorado River above Dotsero. Using water for agriculture remains at the heart of water conversations in Colorado. DENVER – With the recently released Colorado Water Plan calling for 400,000 acre feet of new water storage facilities, many of the state’s water providers and users are eager to get an estimated $13 to $14 billion worth of projects underway. But just which projects, built with exactly what money, is not yet clear. The water plan, put together in two years by the staff of the CWCB with the input of nine river-basin roundtables, does not include a prioritized list of projects, or, one could say, a detailed game plan. Such a to-do list may emerge relatively soon, however, as the roundtables are now being asked by the CWCB to update their “basin implementation plans” and to identify, screen and recommend locally prioritized projects. The roundtables have also now been tasked to work on a $1 million update of the 2010 Statewide Water Supply Initiative, or SWSI (“swahzi.”). It’s a more technical document than the Colorado Water Plan, which was weighted toward policy and process. “Yes, the light at the end of the water plan tunnel turned out to be the oncoming SWSI train,” said Brent Newman, a program manager in the water supply planning division at CWCB. In addition to sharpening its physical plans, the CWCB and the Interbasin Compact Committee, which includes members from each roundtable, are developing a funding plan. “We know that the $14 to $16 billion of projects that we need, the state’s not going to pay for all that, water providers will find ways to finance that, but in order to provide a ten percent guarantee loan for those, we need to $1.4 to $1.6 billion between now and 2050,” Jacob Bornstein, a progam manager in CWCB’s water supply planning department, told the members of the Water Congress on Jan. 29. (Bornstein has since taken a position at the Spark Policy Institute in Denver). And the real state funding need, adding in the cost of environmental restoration and public education programs, may be closer to $3 billion. “So that’s really what we’re talking about,” he told the Water Congress. “It will probably take some type of initiative, or something like that,” Bornstein said, suggesting a statewide ballot initiative. And so a current option being explored is to put a statewide funding question in front of voters that would raise $100 million a year, or $3 billion, by 2050. The state then envisions creating a 10-percent guaranteed-loan fund of $1.3 to $1.4 billion to help spark projects ranging from piping irrigation ditches to building large dams. 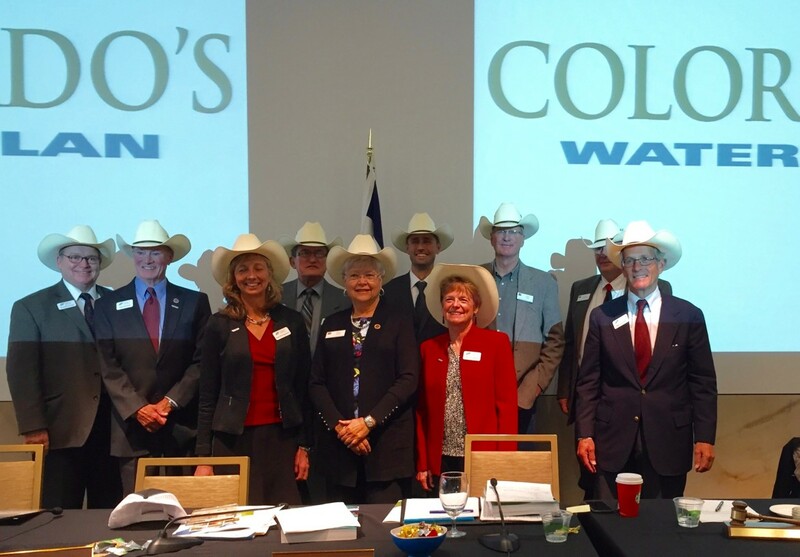 The Colorado Water Conservation Board, after unveiling the Colorado Water Plan in Denver in November 2015. The board includes eight voting members from river basins in Colorado and one voting member from the city and county of Denver. Russ George, far left, represents the Colorado River basin. The CWCB’s approach of using the basin roundtables to prioritize and promote projects, and help develop state plans, can be cumbersome and time-consuming. The Colorado River basin roundtable, for example, has 50 members with diverse views and meets every other month in Glenwood Springs for four hours. And some roundtable members around the state were disheartened to find out in January, fresh off a frantic push to finish the Colorado Water Plan by December, that state funding for basin-specific project grants was going to drop sharply due to the downward swing in severance tax revenue. The last two years the CWCB has received $10 million in revenue from taxes levied on oil and gas extraction, which is shared between a statewide account and nine basin roundtable accounts. But the recent downturn in the gas patch, combined with a lagged property-tax deduction for gas producers, has state officials facing a 25 to 50 percent drop in funding for water projects over the next two years, at least. “So while normally in January the Arkansas roundtable would get $120,000 in their basin account, it may be closer to between $60,000 and $100,000,” said Newman, during a presentation in January to the Arkansas roundtable in Pueblo. Roundtable grants usually cover only a portion of the cost of a water project, but they are a stamp of approval and a recommendation to the CWCB for statewide funding. “You better expect less money,” said Diane Hoppe, the chair of the CWCB board, told the Arkansas roundtable members on Jan. 13. And George, her fellow CWCB board member, re-emphasized that point during the CWCB board meeting on Jan. 25 in Denver, just as the board was in the process of approving a series of roundtable-recommended water project grants. 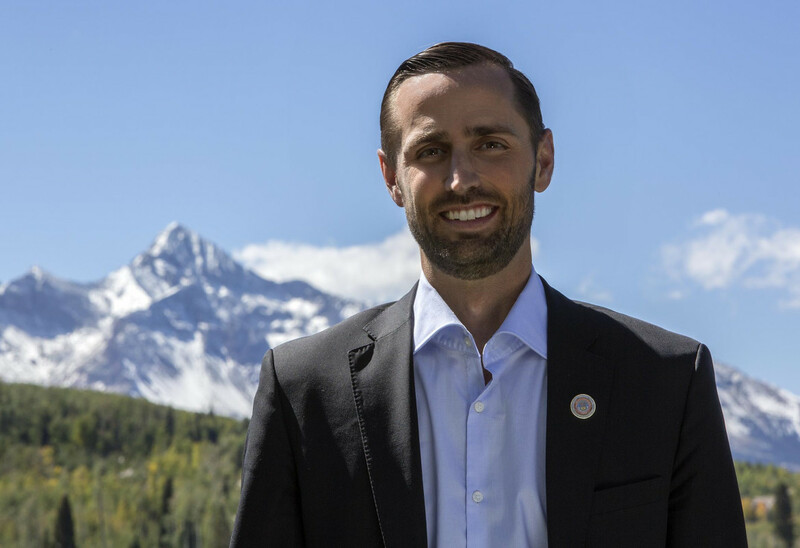 George, from Rifle, has been the director of both the state’s Department of Natural Resources and Department of Transportation, and he served as speaker of the Colorado House of Representatives. 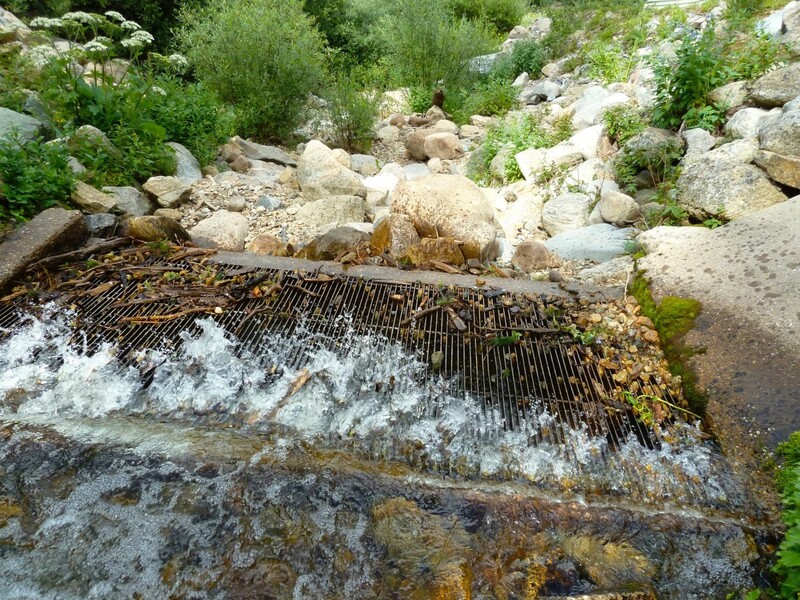 The grate in place on Sawyer Creek, a headwaters stream in the upper Fryingpan River basin, that captures water and sends it under the Continental Divide through the Fry-Ark project. There are several streams in the upper Fryingpan basin that could still be diverted via Fry-Ark. For some stakeholders in the Roaring Fork River watershed, uncertainty about statewide funding resources might be a relief. Most of the new or expanded reservoirs and new underground storage facilities envisioned east of the Continental Divide will be able to store Western Slope water. And more Front Range storage capacity is expected to increase the pressure on the Roaring Fork and the Fryingpan rivers, which already have about 40 percent of their headwaters sent east through existing tunnels. And the heavily used Colorado River is under constant stress. “The acceptance of the final Water Plan should not be the precipitating event in a race to see who can establish the biggest entitlements and take the last drop of available or theoretically available water out of the Colorado watershed leaving the West Slope to be whipsawed between Front Range dependence and Colorado compact obligations,” Pitkin County told the CWCB in a Sept. 17 letter. And the county’s Health Rivers and Streams Board offered the state a similar sentiment. “It is unacceptable for the growing population of the Front Range to look to the Colorado basin or our drainage as a resource to be exploited rather than a resource to be preserved,” the rivers board wrote in a Sept. 17 letter. On the other hand, the state’s water plan does include goals that could benefit Western Slope rivers and streams. For example, it calls for “stream management plans” to be developed for 80 percent of the state’s rivers. Those plans, to be developed locally, could show how current diversions are affecting rivers and lead to alternative approaches. The plan calls for a collaborative “multi-purpose” approach to water projects that could bring benefits to water-starved streams and rivers, albeit benefits tied to new water-management infrastructure. And it sets goals of finding 400,000 acre-feet of municipal water conservation savings by 2050 and developing effective alternatives to the ongoing “buying and drying” of farm land. 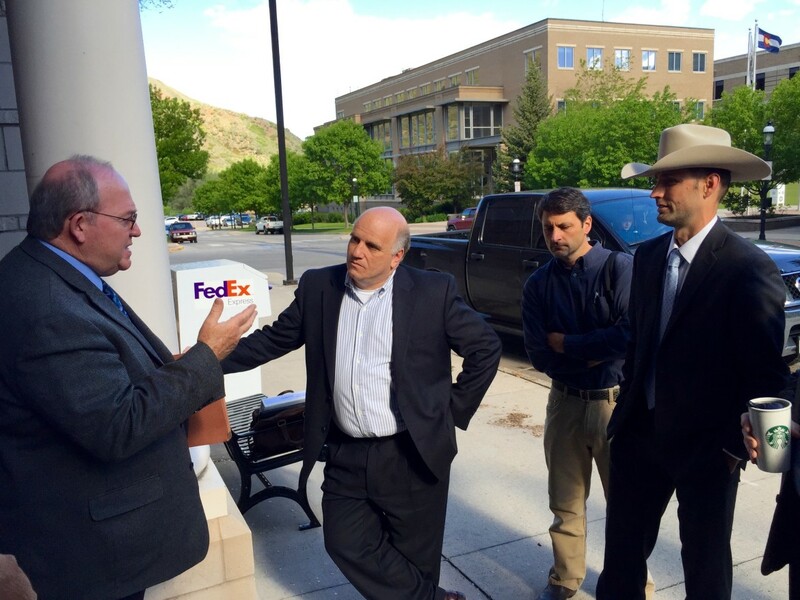 From left, Russ George, a CWCB board member, Andrew Gorgey, then Garfield County manager, Peter Fleming, general counsel for the Colorado River District, and James Eklund, director of the CWCB, talking about the potential for new transmountain diversions outside of the Garfield County building in Glenwood Springs in 2015. An outstanding question facing the Colorado water industry is whether it can develop the “political will” to gain funding for, and approval of, big water projects. And it was the topic of a high-level panel discussion at the Water Congress meeting called “The Political Will To Get Things Done,” moderated by Jim Lochhead, head of Denver Water. “I really want to see the state step up,” said Mike Applegate, the president of the board of Northern Water and the CEO of Applegate Group, an engineering firm specializing in water projects. “I would ask the governor to take this document (the water plan) that he asked us to put together and take it on the road. He needs to talk to all of the federal agencies that get involved in our projects. This is going to be purely political, but hand it to them and say, ‘This is our road map to the future, we really think this is a good idea, we like what’s in here, you guys to need to help us make it happen,’” he said. Northern has been working for years to gain federal approval for its NISP project, which stands for Northern Integrated Supply Project. It includes two new reservoirs near Fort Collins, Glade and Galeton, which would hold 170,000 and 45,000 acre feet of water, respectively. Northern also wants to build Chimney Hollow Reservoir, as part of the Windy Gap Firming Project, to add 90,000 acre-feet of storage near Loveland. Meanwhile, Denver Water is working to enlarge Gross Reservoir, southwest of Boulder, to hold 77,000 more acre-feet of water, as part of the Moffat Collection System. That drew a response from Dave Merritt, an engineer who sits on the board of the Colorado River District and is a former Glenwood Springs city councilor. “From a West Slope perspective, I never thought I’d be in situation where I felt sorry for Denver and Northern,” Merritt said. “But I do. I feel that we are long past the decision process in both Moffat and Windy Gap. The governor needs to make a statement. Are you going to support it? Or are you not going to support at it at this point? The majority of the members of the Colorado basin roundtable, however, do not share Merritt’s view. In its September comment letter on the water plan, the roundtable’s position was that it is “adamantly opposed to the concept of state endorsement of a project … before the completion of the final federal EIS. “The sole purpose of this endorsement is to apply political pressure on federal permitting agencies. The state should not assume a role as a proponent of a water project until the state regulatory process has been completed and the project has been agreed to by the impacted counties, conservancy districts and conservation districts in the area which would be impacted by the project,” the roundtable stated. James Eklund, the director of the CWCB, hails from a Western Slope ranching family. He often works to add a touch of levity to otherwise serious-minded state-level water meetings. In the face of still-uneasy Front Range-West Slope relations, Eklund, the head of CWCB, tried to bring a little levity to the Water Congress convention, which brings together water owners, developers and managers from all the basins in the state. “Storage, as I said, needs 400,000 acre-feet more/where and how much, that’s our chore,” he rhymed, moving from his earlier Super Bowl analogies. “Now these things cost money above our existing abilities/but the low hanging fruit is ground water storage and existing facilities. “Governor Hickenlooper gave ag a shout-out in the state of the state/buy and dry is happening at too high a rate. “For us to get 50,000 acre-feet in alternatives by 2030/we water lawyers and community have to get out hands dirty. The last line is a reference to two citizen initiatives that have been submitted for possible inclusion on the November ballot which would weaken Colorado’s “first in time, first in right” water laws and move the state’s approach to water administration toward a “public trust” system. It’s fair to say the Colorado water industry sees the questions, and the threat of a public trust doctrine, as the equivalent of nuclear bombs. Or fourth-quarter interceptions run back for touchdowns. And the Colorado Water Congress is working to tackle the questions before they reach the ballot in the first place, or to defeat them if they get put in front of voters. In other words, welcome to the big game. Editor’s note: Aspen Journalism is collaborating with the Aspen Daily News and Coyote Gulch on water and rivers in Colorado and the West. The Daily News published this story on Super Bowl Sunday, Feb. 7, 2015.